In November 2015 the famous Disney duck artist Don Rosa visited Copenhagen to participate in the comics convention Art Bubble at The Round Tower. As usual he drew huge crowds of duck fans from all over the country, who wanted Don’s signature and a drawing of Scrooge McDuck, Daisy or some of the other characters from Denmark’s most popular comics magazine, “Anders And & Co.” – which also sported a Don Rosa cover that week and a short story inside the magazine about Scrooge McDuck visiting the festival. 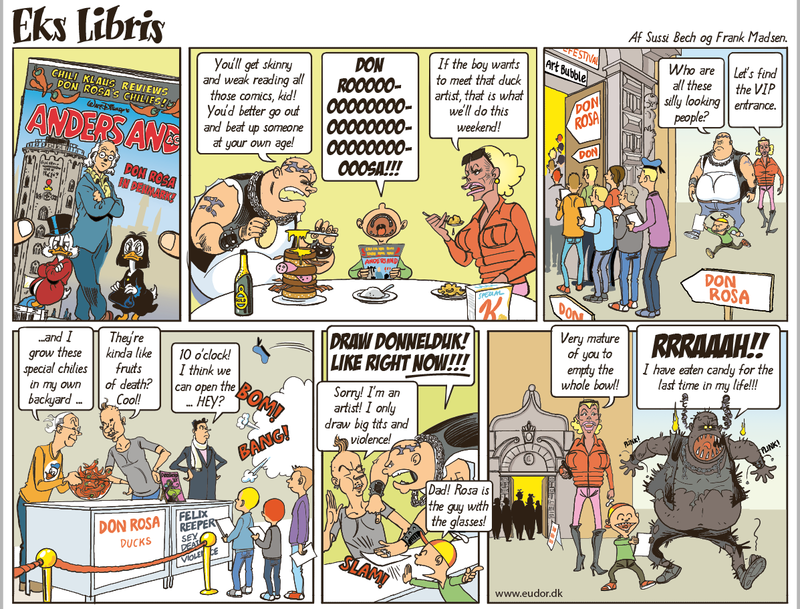 Sussi Bech and I could not resist the opportunity to include the event in our comic strip “Eks Libris“, that has been a part of weekly newspaper Weekendavisen’s literary supplement since 2009. As always we let our dysfunctional biker family visit the event and spread havoc. But noone, and least of all Biker Joe, expected Don Rosa’s secret weapon: home grown chilies. A treat that I tried myself during the festival dinner, where Don himself took a walk around the restaurant offering generous samples. After the festival we were contacted by a Danish Don Rosa fan, who wanted to buy the original drawing and an English translation of the strip to show Don.